Toda raba, toda raba; thank you. I want to thank all of you. By the end of this Masa, I’ll be thanking you in Hebrew and you’ll all understand. But you understand anyway. I want to welcome my good friend Natan Sharansky; the Deputy Minister of Education, Avi Wortzman; the Director, the Head of the Directorate of Masa, Aaron Abramovich; and the new Director-General Liron. She worked for me, and she’s great. And all the members who are here, from Masa and from the Jewish Agency, and most of all, all of you from Masa. Now I’m going to talk about Masa, and masa means journey. The Jewish people are on a great journey. That journey began here, in this land, almost 4,000 years ago, when Abraham came here. And we’re here, and we are going to stay here, forever. Now, there are those who don’t want us to stay here. And they are openly declaring their intention to destroy the Jewish state. They’ll never achieve that, because we won’t let them. Leading them is the regime in Iran. And Iran is pursuing a plan to build nuclear weapons for that purpose. Now, I’m not impressed with the reports that we hear that Iran has not expanded its nuclear facilities. And the reason for that is they don’t need to. They’ve got enough facilities, enough centrifuges, to develop and to complete the fissile material which is at the core of an atomic bomb. They have that, and the test today is not whether they add to the capacity they already have. The question is will the international community rollback what they have. Rollback means that they dismantle centrifuges and that’s not included in the proposed deal in Geneva. That’s what we seek to do. I understand that there’s an argument that people make. They say: “If we don’t strike this deal…”. This bad deal with Iran, from our point of view, from the international community, that’s a bad deal. But people say: “If we don’t strike this bad deal with Iran, Iran will walk away from the deal.” Well, I have news for you. They’re not going to walk away from this deal. It’s a dream deal for them. In fact what has to be done is to get a good deal for us, not for Iran. A good deal for security; a good deal for peace. And you’re not going to achieve that with smiles; you’re going to achieve that with pressure – sustained pressure of sanctions. That’s what’s required. This is part of our journey. This is part of our effort. But I guarantee you one thing. Israel will not allow Iran to get nuclear weapons. Now, we’re celebrating, we’re celebrating the tenth anniversary of Masa, and in this decade, 85,000, eighty-five-thousand young Jews, young men and women came here from so many countries into these Israel programs. And this year 11,000 participants, more than triple the annual figure before Masa program are here. I don’t think all of you fit here, but you came here from all over the world. You came here from Russia, from France, from the United States, from Great Britain, from Brazil, from Canada, from South Africa, from the Ukraine, from Venezuela, from Turkey, from many, many lands. You came here from many lands to this land, and this is your land. And you decided to devote a year of your lives to live in Israel and you can see the dynamism of this country, the energy, the initiative, the diversity, the beauty, and you’re learning to be part of this land, part of our people, part of Israel. You are. You’re working with wonderful programs to protect the environment, to help elderly Holocaust survivors, to work with youth at risk, to meet your counterparts, your young Israeli counterparts who are here working with you. In fact, I want to tell you, I have personal knowledge about this. I know firsthand because my younger son Avner is here with Gar’in Atid and they love working with you. Avner, why don’t you come up with the Gar’in. תבואו, עלו לבמה, come on. Come on. No, the Gar’in too. Come on, come on, all of you with Gar’in Atid. Come over. Come on. בואו. בואו הנה, בואו. לצד הזה. So the last time Avner and I stood on a stage is when he won the Bible championship, and now these are the champions who are here, and there. All of you, you are all champions, champions of Masa. And I know, because he tells me, you know, at the times that he’s allowed to go home. He comes home and he says, Abba, these are great kids and this is a wonderful program. And he brings the kids who are with him from abroad and they’re wonderful kids, and they get to know Israel and they get to be the ambassadors of Israel. Now, I want to tell you something. Twenty percent, that’s the statistic, I checked it, 20% of you who are here are going to come back permanently, as olim, and Avner just whispered in my ear, he said, say it. [Avner: “It’s not enough”]. It’s not enough. We want more. We want more of you to come. This is your home. And I want you to know, whatever you decide after this masa, whatever you decide, I hope as many of you decide to come back here and join us permanently, but I want you to know that Israel, wherever you are, is always your home. This is the meaning of Masa. So congratulations to all of you, and we’ll see you here, again and again and again. 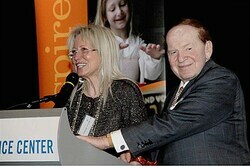 The Birthright-Taglit program are to receive a much-needed infusion of cash from top philanthropists Sheldon and Dr. Miriam Adelson. Prime Minister Binyamin Netanyahu addresses the thousands of young Jews who came to Israel as part of the Masa Israel project. Prime Minister Binyamin Netanyahu addressed on Tuesday the thousands of young Jews from around the world who came to Israel as part of the Masa Israel project, which is co-sponsored by the Israeli government and the Jewish Agency. In his speech, Netanyahu called on the participants to make aliyah to Israel and to defend Israel in their countries. The Masa Israel project brings each year about 10,000 young Jews from around the world for study and volunteer in Israel. The project aims to strengthen ties between Israel and the Jewish world. Upon their return to their countries, many participants assume key positions in their communities and become ambassadors of Israel in their countries. In recent years, many Masa Israel participants have made aliyah. Natan Sharansky just said something absolutely shocking. He said that there are differing opinions among Jews. No! That may imply that you have four people with four opinions. See, it’s not true – it’s four people with eight opinions. We debate, we argue, we discuss, we disagree. Then we agree. I’ll tell you what we agree on. See, when Natan, who is a hero of the Jewish people, when he was jailed in the Soviet Union and he could have avoided going to jail; all he had to do was give up his desire to come to Zion, to come to Israel. All he had to do was do that. But he wouldn’t. So they put him on trial, and they sentenced him to a long prison term. And then they asked him, “Do you have anything to say?” He said, “To you, this court, I have nothing to say, but to my people and to my beloved wife, I say, ‘Next year in Jerusalem'”. That’s what we agree on. This year in Jerusalem. I am very happy to see all of you here, this year in Jerusalem. I know that you’ve come here from many countries. I have to say that I saw some of you outside, but you come from all over the world. You come from Mexico, from Britain, from France, from Australia, Canada, Brazil. What about Russia? Or from the Ukraine? But I gather there is no one here from the United States? So, you come from many different countries, but deep down this is your one ancestral home. This is your country. Israel is your homeland; Israel is your birthright; and Israel is your future. So, I want to ask a direct question: how many of you plan to make Aliyah? Stand up if you’re making Aliyah. That’s great. Let’s give them all a round of applause. Thank you. Now, first of all, we embrace and welcome all of you who are coming here physically to join us to build the Jewish future, and we send with love all of you who are planning to go back to your countries, and I think Natan said a very important thing: you’re taking back with you something very, very precious. You’re taking back with you the truth. You can speak the truth about Israel. And that’s what I expect you to do. You see, there are many people around the world who, day in and day out, malign Israel. It used to be acceptable to spread the vilest lies about the Jewish people, and now, unfortunately, it’s acceptable to spread the vilest lies about the Jewish state – to slander and malign Israel. But all of you have gotten to see the truth for yourselves. You’ve seen what a great nation this is. You’ve seen the signs. You’ve seen the technology. You’ve seen the progress. You’ve seen the growing, bustling cities. You’ve seen fun. There’s a lot of fun in Israel. By the way, it’s not true that it’s only fun in Tel Aviv; it’s also fun in Jerusalem. It’s great. You’ve seen that Israel is an open, pluralistic society. You’ve seen that in the Middle East, where the rights of women, gays, minorities – anyone who’s different or anyone who’s a minority or anyone who’s not cut from that rigid ideological cloth – you see that in Israel people are free; people are endowed with rights; that Israel as a liberal democracy stands out. And you’ve seen about something else: how this nation cares about each and every individual. You know, today we had a terrible tragedy in the North. It was an entire family, eight souls that were lost in a tragic car accident. And you know, the whole country is focused on one survivor, a little girl called Rachel. Rachel, the entire nation is with you. The entire nation embraces you. Everybody embraces this little girl, and that’s the truth about Israel. The whole world wondered how we could unite and sacrifice so much for a single soldier, just to return one soldier: Gilad Shalit. We did that because we care about each and every life. See, our enemies think that because they celebrate death – they have a cult of death – they think they’re strong and they think that because we celebrate life, we’re weak. But it’s exactly the opposite. We’re strong because we celebrate life and we’re strong because we’re prepared to defend our lives. And Israel will win because Israel loves life. I want you to go back to your countries, and I want you to do two things. One: I want you to reconsider Aliyah, that’s the first, because you have a brilliant future here, brilliant future. This is a cutting edge country – in technology, in agriculture, in medicine, in art, in literature. In anything. This is a country not only of a lot of opinions, but a lot of talents. You know we have more Nobel Prizes per capita than any other country in the world? Maybe one of them is sitting here. We have tremendous opportunities for young people, but we have something that we can offer you that I think you’ve figured out in the time that you’ve been here, and when you leave, you’ll have a perspective. This is where the heart is. This is where the Jewish past and the Jewish future blend. This is where you can shape not only your own individual lives, but the lives of our people, and we’ve travelled for nearly 4,000 years – 3,000 years in this city alone – to ensure our future. Be part of it. Don’t pass it up. You can give deep meaning to your lives. So I want you to reconsider Aliyah, and defend Israel. Defend Israel by saying the truth and defend Israel by being proud – proud of your heritage, proud of your Jewish identity, proud of the fact that together, we’re building and ensuring our common Jewish future. Thank you very much. Thank you Masa.